Maurizio Sarri has branded Eden Hazard as irreplaceable as Real Madrid prepare a mega money swoop for the Chelsea star. The Blues attacker produced an unstoppable display, including a mesmeric solo goal, to help Chelsea into third in the race for Champions League qualification. However the Stamford Bridge club are set to lose Hazard this summer as Real make the Belgium international at top priority ahead of next season. 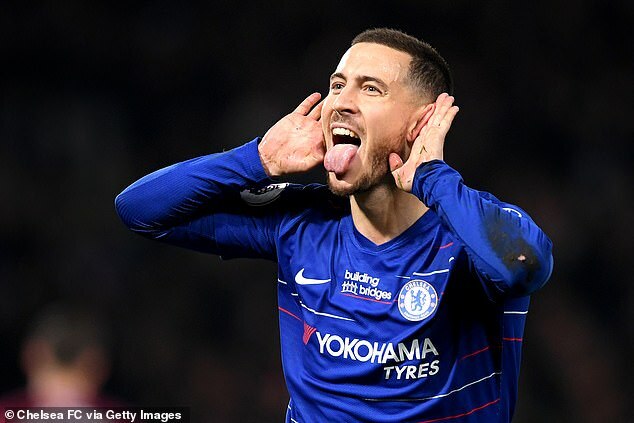 Chelsea want at least £100million for their talisman, a valuation that could yet prove a stumbling block towards a move, and Sarri admitted that the prospect of losing Hazard is unthinkable for Chelsea. ‘From the technical point of view, we can’t afford to lose him,’ said the Blues boss. ‘Also because it’s impossible to find another Hazard. At the moment there isn’t another Hazard, the level is so high. ‘You’d have to find two players to make the level of Hazard. So I hope Hazard can stay here, otherwise we’ll have to try something different. ‘I’m sure the club doesn’t want to sell him, but, of course, we all have to respect his decision, I think. He’s in the last season of contract (next year). Hazard himself insists he has not made a final decision on his future, though Eagleseye Footy understands he wants a move to the Spanish capital. ‘I am focused with Chelsea till the end of the season. We still have top four and Europa League. There is still a lot to do and then we will see,’ said the Belgian. Meanwhile, there was a fresh injury concern for West Ham manager Manuel Pellegrini after Samir Nasri sustained a calf strain at Stamford Bridge.